I insisted on going to this Filipino restaurant even though my Pinoy friend was very reluctant. I insisted because he can be my Intro to Filipino Food 101 lecturer. And he was reluctant…I dunno why, I suspect that he was afraid that I dislike the cuisine. His consideration for me was sweet… but as Britney sings, “all you people look at me like I’m a little girl..” which means I can fend for myself. Come on! I know what I want. There were two famous dishes we didn’t order. He wanted “Sisig,” a hotplate dish, listed under appetizers, but we already ordered two dishes. The other is Crispy Pata (boiled, chilled and deep fried pork hocks), which he didn’t recommend but every table had this dish. The serving for Crispy Pata is HUGE, enough for 4-6 people. Next time I come, I must try this. 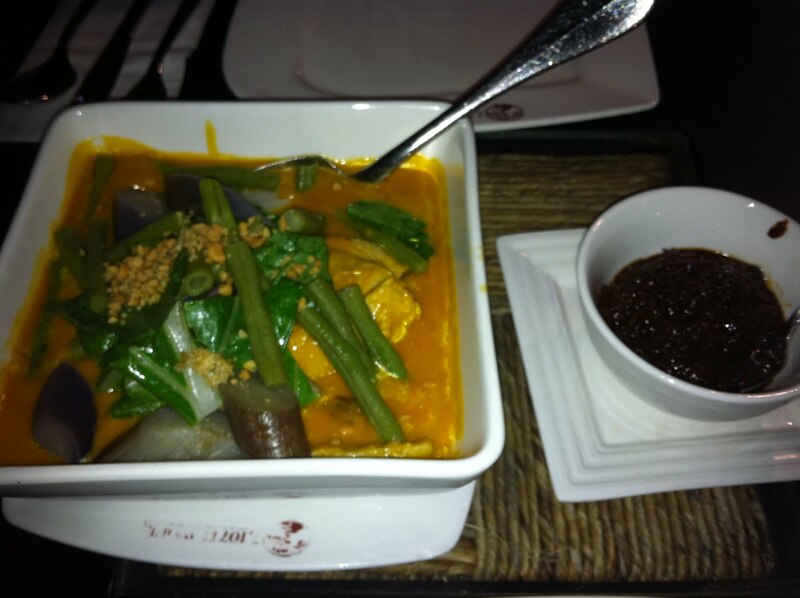 We ordered Kare-Kare and Chicken-pork adobo. I cannot believe the #1 food critic on HGW, Hoongy, can be ignorant of the fact that Kare-kare is bland. 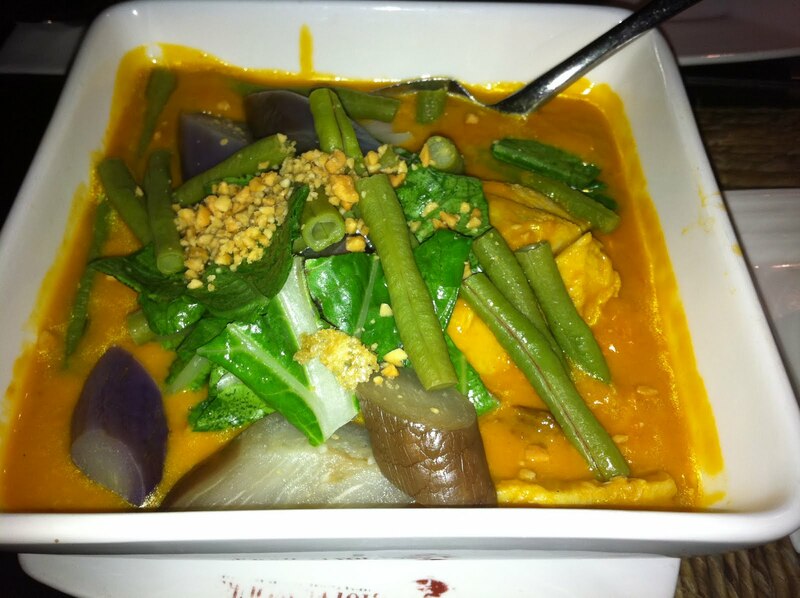 No salt is added to Kare-Kare at all. The sauce you see is a mixture of peanut and rice grind till they are liquid. This is a very time-consuming dish to make. Not only because of the sauce, but because the tripe (cow’s stomach) has to be simmer for some time so that it softens. There were two pieces of oxtail here–and honestly, i don’t care much for oxtail because I kept imagining the part when I was eating it. But the meat was soft and very tender, not at all like beef. It melted in one’s mouth. The tripe was chewy jelly, not very soft, but no complaints here. The jelly texture needed some gungho-ness to eat. If this dish is bland, then what is the point? The point is you have to mix the shrimp paste with the sauce and rice and eat it together. The shrimp paste tasted like the chinese fermented black bean paste, very salty kind. My friend was very surprised that I kept eating the paste. I told him the paste has a very Chinese taste. So this dish tasted of all flavors: the fragrance of rice, the sweetness of peanut, the meat taste from beef, and saltiness from shrimp paste. Quite a unique and delectable dish. My friend also mentioned that because kare-kare requires so much effort to make, Filipinos only cook it during festive gatherings. But something was missing in this dish, a kind of banana that is available in Philippines. I bet the sweetness of the banana would have change the taste of the dish, making the taste fuller. Recognize this? This is another very Chinese dish. I thought Filipino food has much Spanish influence (you know they were colonized for 400 years) but you can probably recognize this. 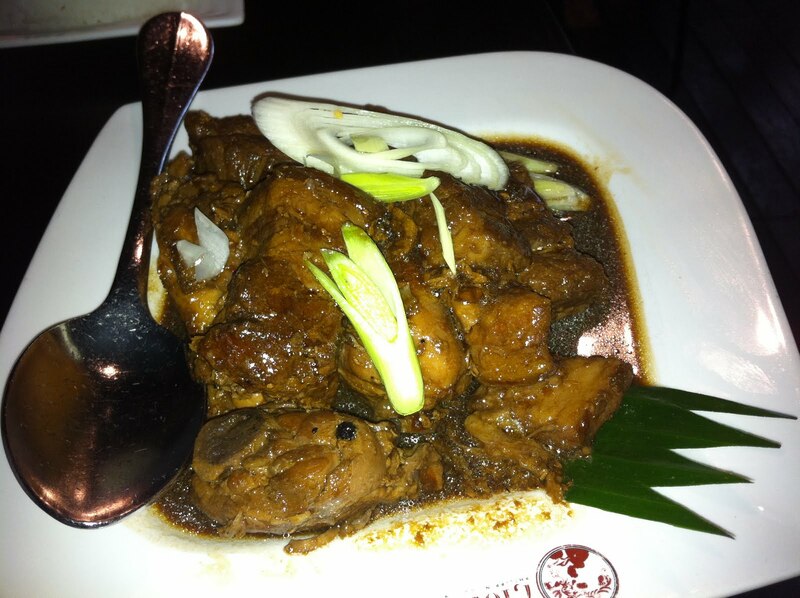 At first, my friend ordered Adobong Baboy (just pork) and the waitress suggested we get “chicken-pork adobo.” This dish is stewed in garlic and vinegar and soy sauce. The chicken tasted like the Chinese soy sauce chicken except this dish is saltier without the fragrance of sesame oil and musk of the mushrooms. And the pork tasted exactly like kong ba. I ATE THE ENTIRE PORK, INCLUDING THE LAYER OF FAT. OMG SO SINFUL BUT it melted and was worth the calories. But my Filipino friend who has a food stall in Philippines said that he could cook better Adobo than this. This one had not enough garlic. At this point, I ate two bowls of rice and my big-sized friend who ate one bowl was full. So I asked him, “Er..are you full?” Yes, he was. Then I said, Filipino food is so sinful and fattening, why are Filipinos still so skinny? He said that in Philippines, they eat very little, only a bowl of rice with a dish, unlike the cai fan in Singapore in which Singaporeans will get three or four dishes. He was bursting at the seams; but I MUST MUST MUST have dessert. Sorry, I can skip the main course but I must fulfill my inherited destiny of getting diabetes at 35. 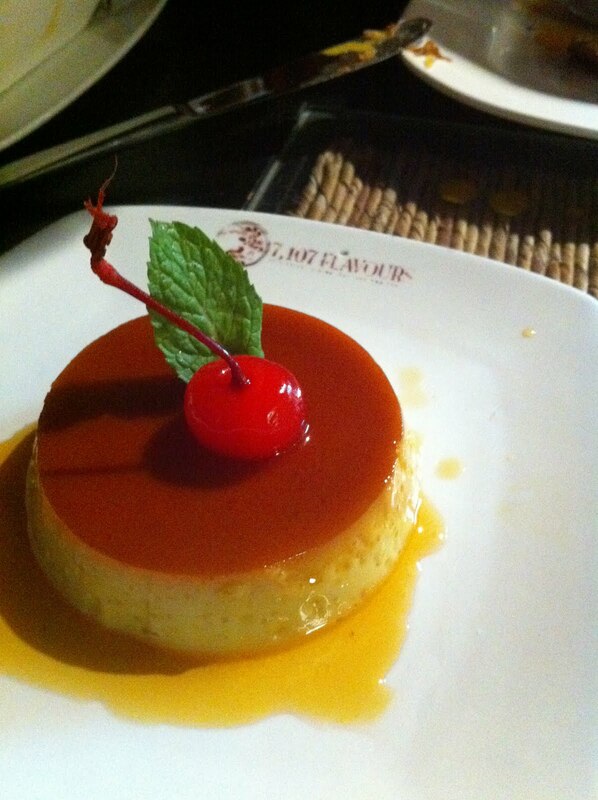 So my friend suggested “Leche Flan,” which is condensed milk and egg, steamed, and chilled, with brown sugar syrup. It tasted exactly that. Quite a waste of calories. No wonder no one eats dessert because no one comes to a Filipino restaurant for desserts. Total bill with rice at $1.50 a bowl (a bit ex for rice? ): $56 for two. There was entertainment, a singer, which I didn’t care much for. The decor seemed quite authentically Filipino, according to my friend. The servers were too few to handle the crowd, as a result, we waited a long time for them to notice us. Overall, the food was good and special enough to entice me to visit a second time but I thought it was too expensive. One last titbit: 7107 flavours is named because Philippines is made of 7107 islands. Call to make reservations. May get very crowded. >i havent tried filipino yet…but I'm sure I'm gonna love it! >My philosophy is: one should try everything at least once and if you hate it, then you should try it again! Do they have balut? It is an acquired taste though. I don’t know. But just to let you know 7107 flavours are relocating and opening at another place. In the meanwhile, you can visit Bonafacio.